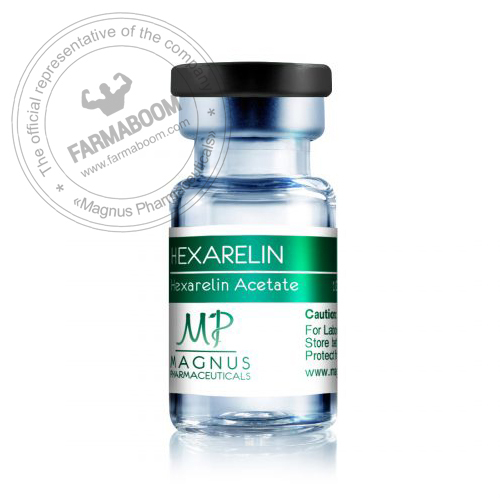 Hexarelin has won deserved popularity among athletes due to its ability to increase the level of somatotropin by stimulating its synthesis and, consequently, improving physical performance. In addition, the tool is used for prophylactic purposes (it was originally created for this purpose) for the normalization of the processes associated with growth hormone deficiency. Hexarelin peptide belongs to the generation of the newest means aimed at stimulating somatotropin. The effect of it is achieved within a few minutes after the injection (according to research data). Moreover, compared with other ghrp, hexarelin has a longer half-life – just over an hour. Hexarelin, entering the bloodstream, increases the level of somatotropic hormone in two ways: it binds to ghrelin receptors and blocks the production of somatostatin. Hexarelin injections also contribute to the enhancement of IGF-1 in the bloodstream. In addition, the use of Hexarelin peptide helps rejuvenate the skin, strengthen hair and nails, enhance immunity, prevent inflammatory reactions, and also protects the liver from destruction. Unlike GHRP-6, hexarelin does not cause increased appetite, so it can be used both during weight gain and during drying.